Had the Crunch since 2003. Been wearing it everyday minus the 3 days I left home without it and felt alone all day ! Own the Supertool 200, 300 and Rebar, but I just can't stop carrying the Crunch in fear of needing the locking pliers. The only thing that would make it a 10 is a heavy duty phillips and a drop point blade instead of the serrated. Love this thing and have turned quite a few people on to it through the years after they've seen me get out of quite a few binds with it. I'm in the mechanic / farming occupations. This is probably the most misunderstood multitool. When people buy this they don't seem to understand that the main idea is the lock pliers and not the amount of tools. 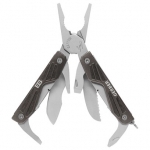 The lock pliers are excellent and unlike in many other pliers, this one has a groove that goes length wise on the nose of the plier making it excellent for grabbing something very thin like needles or fishing hooks without the fear of them rolling. I do some ocassional welding and sometimes I need small lock pliers to hold pieces together and this one has proven to be absolutely priceless. The other tools are very basic, flat/phillips screwdriver, file and serrated blade (which I'd prefer to be straight). Like the other reviewer said, the locking bolt comes in the way of the other tools but you can always screw it off while you need to use screwdriver or the blade. 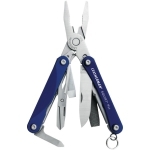 Leatherman Crunch is for people who knows what this tool is designed for. Not for your average joe. I have had it for 12 years now. The pliers work fine, the steel is very good, they show some rust, (i have always lived in the mountains away from the sea air). The philips driver is made of cheap steel, wore out the first time i used it. flat drivers and file are fine. the knife is ok, have never sharpened it but it works ok.
has a serious design flaw with the small tools, when you open them the bolt interferes with them, making knife almost useless. The locking pliers work ok. after all these years, the only value of use the tool has is the locking pliers. wich are ok.